Sussex seamer Ollie Robinson bowled his side into a strong position with 3-29 as Glamorgan slumped to 126-6 at Colwyn Bay, 152 runs ahead. 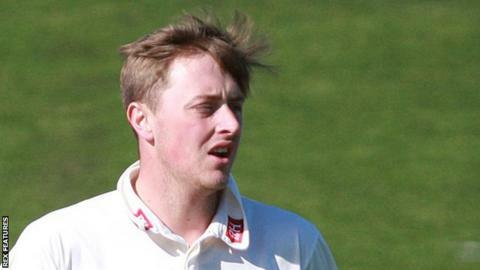 The home side were well placed on 60-1 at tea, but lost five wickets for 35 in an hour. Chris Jordan (2-39) was also threatening in the evening gloom. Earlier Ben Brown's 77 steered Sussex to 268 after Craig Meschede (4-61) and Ruaidhri Smith (3-64) made early inroads. Glamorgan looked like securing a more substantial first-innings lead, but Brown marshalled the tail, last man Jofra Archer chipping in with 27 not out. The inexperienced home top order struggled in turn, with Jack Murphy's 27 the top score, although first-innings top-scorer Meschede is unbeaten overnight. A target of more than 200 could prove demanding for the promotion-hunting visitors on a pitch of inconsistent bounce. "I was so happy to get that single to get off the mark and get off a pair, then it took me one straight drive to get comfortable, it was nice to find my feet and get a few runs but a shame about the dismissal. "We managed to see Robinson and Jordan off and we were going quite comfortably but both set batsmen getting out in a couple of overs proved crucial and they bowled well especially in bad light. "Hopefully we can come back with Mesch (Craig Meschede) and Tom Cullen, our heroes from the first innings, and get a lead of 250 on this pitch with a few keeping low." "It's been a really good cricket wicket and it seems to come to life at times, a topsy-turvy day and the game's well set up. "I was pleased to get some runs and you pride yourself as a middle-order player on situations like that to try to change the game, with the guys batting well down the order. "We've got a long batting line-up and I think we'll need it, but we've clawed our way back into the game really well."